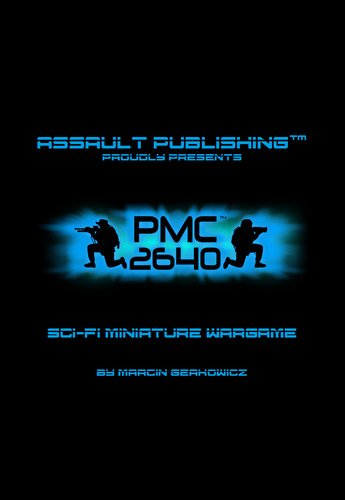 PMC 2640 is the third wargame made by Assault Publishing and deals with warfare in the 27th century. Although there are plenty of sci-fi wargames, PMC 2640 has many interesting features which make it unique and very enjoyable. PMC 2640 is designed as a ‘true company scale’ wargame, which means that it runs smoothly both with a few as well as a few dozen units on the battlefield. This was achieved by eliminating sophisticated, but unnecessary special rules, and limiting the number of counters to morale markers only, represented by D6 dice. The ruleset itself is compact and elegant, written in simple, “international” English, leaving no place for vagueness and multiple interpretations. On the other hand, PMC 2640 offers countless possibilities, as the rulebook contains a few dozen of unit entries, six scenarios and seven terrain generators, all of which ensure that no two games will look the same. The classic alternate activation (with small balancing modifications) makes the game fast and addictive. 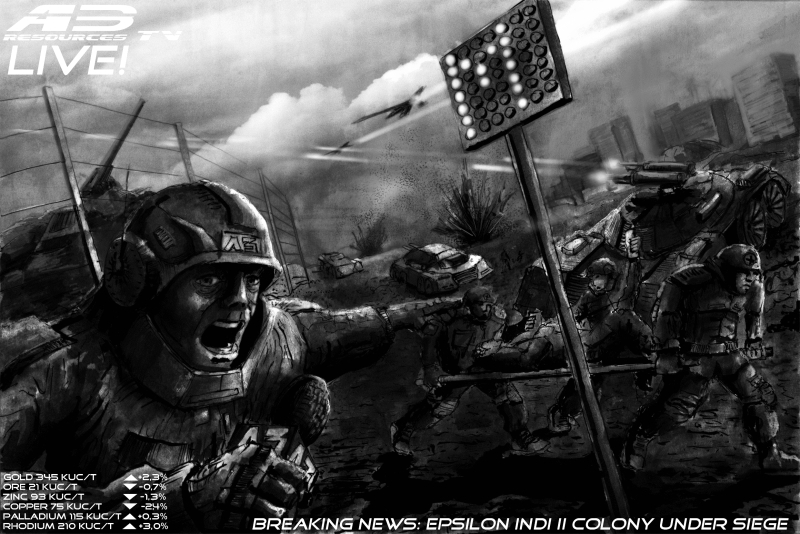 The unit/team is the basic element of the game and all parameters are given for the whole team, with the number of soldiers modifying just a few parameters (Firepower, Assault and Morale, to be precise). We do not worry about equipment of individual soldiers. Rifle team is a rifle team, whether they use assault rifles, lasers, neutron blasters or any other similar weapon. There are only two requirements: they units have to be Recognizable and Cool-Looking! This allows you to prepare and field the coolest teams you can, with sarges, medics, war correspondents or whoever else you wish, as long as there is no doubt what unit the miniatures represent. The available units are diverse and work best when properly teamed. For example, assault troops charging through an open field will probably get bogged down, decimated and finally forced to retreat. But support them with heavy weapons teams who will pin down the defenders, and the attack will be much more effective! PMC 2640 does not feature a typical point value system. Instead, all units are grouped into Tiers which correspond to their level of training, experience and equipment. What is more, the battles have their own Battle Tiers, which specify the sum of all Unit Tiers and limit the number of units of specific Tiers. Low Tier battles are clashes of unreliable greenhorns, while high Tier battles feature lots of specialised, deadly troops. Another feature of PMC 2640 is a smart, but simple morale system. Morale is not a 0-1 value (didn’t pass – passed) like in the most games, but instead troops under fire get suppression points. When the number of these points becomes high enough, the unit gets suppressed and later broken. To make things more interesting, every lost soldier means a reduction of the Morale parameter, so like in real life, the units with half of the soldiers down usually have little combat value. But even troops which haven’t suffered any losses can sometimes be forced to retreat – though killing a few enemies always helps! PMC 2640 focuses on tactics and proper use of even the slightest advantages the commanders have at their disposal. Terrain pieces are not just decorative dioramas, but play a very important role. They may hide your troops from enemy line of sight, provide them with a defence bonus and/or boost their firepower – definitely something to take into account. Additionally, some of the terrain pieces can be demolished, and buildings or barricades may become deadly traps! Perhaps the most interesting component of PMC 2640 is its campaign system, which resembles those featured in skirmish games. Instead of a chain of several more or less playable scenarios, the players develop their PMCs by playing standard battles. 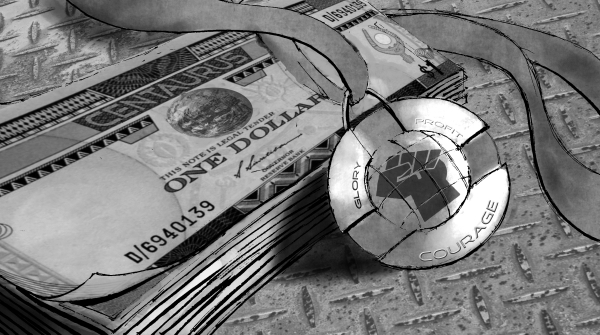 The commanders gain funds to recruit new troops and develop their companies, while the units get experience, upgrades and trauma, all of which affect their performance in later games. And if you want to try something different than typical competitive battles, PMC 2640 allows for solitaire and cooperative games! These are described in a separate chapter with additional rules, six dedicated scenarios and new special units (insurgents and space bugs). Solitaire/cooperative games might not be perfectly balanced (which is probably impossible), but are intended to be as cool and fun as possible. Whether you wish to crush a rebellion of disappointed miners or evacuate civilians attacked by oversized bugs, you will find these games challenging and unusual compared standard battles. 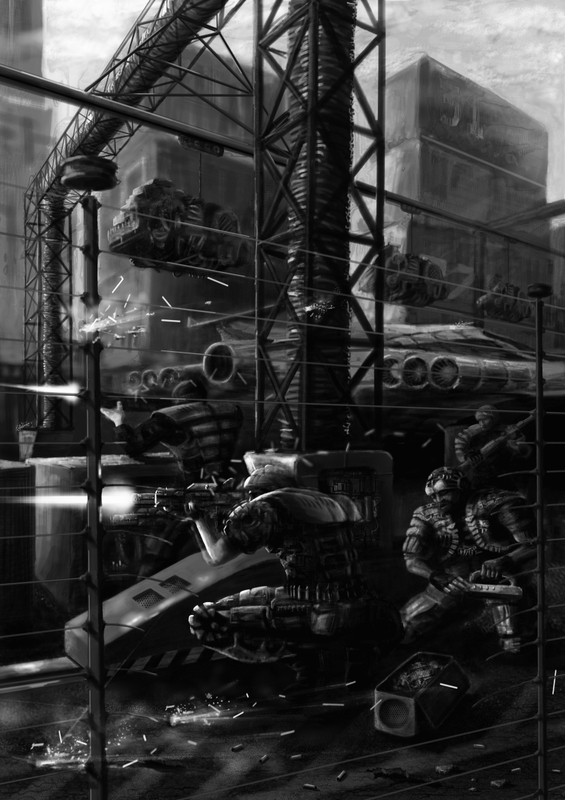 The PMC 2640 rulebook is the first product of Assault Publishing to include an original background story. It contains a brief history of the future from 22nd to 27th century, a description of the rise and fall of the corporations, the genesis of PMCs, and many other events which allow you to get immersed in the world of the year 2640. But do not expect another “Oh-My-God-Evil-Aliens-Are-Murdering-Us!” setting – instead, you will find a hard science fiction universe, inspired more by Blade Runner than Star Wars, where mercenary commanders fight for powerful corporations, corrupted states or colonial authorities – depending on who provides the highest salary! 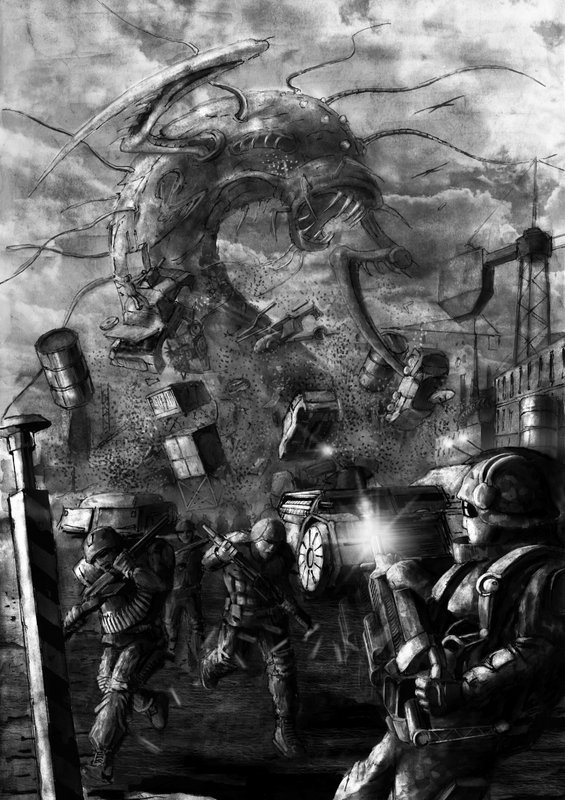 To further help you feel the mood of the 27th century, the rulebook is illustrated by Łukasz Marko (Markotny Drawing Studio) whose independent, rough style perfectly portrays the grim nature of future battlefields. PMC 2640 is designed for scales between 15mm an 28mm, with 15mm as the default one. However, there is a possibility of using smaller scales (like 6mm, 10mm) using minor modifications included at the end of the book.